(l to r) Tim Torre, Sue Schaffel, Anna Jackson, Bob Chaves, and Melissa Robinson. Photo by Toly Yarup. Audience members waited in the lobby of the quaint Highwood Theatre in Silver Spring, MD for the opening night production of Other Desert Cities When entering the theatre, don’t let the size of the room fool you – these actors and actresses on the stage fill the room with their vibrant, powerful performance. The family of four shuffles into the living room, socializing after a friendly tennis match. Siblings Brooke Wyeth (played by Anna Jackson), and Trip Wyeth (played by Tim Torre) are reunited in a visit to their parents for Christmas, where they immediately become reunited. Soon into the first act, the audience is able to get a glimpse of these characters as they reminisce on childhood memories and earlier years. Quick one-liners are consistently dropped into conversations without a heartbeat, making sure to keep the audience engaged. …these actors and actresses on the stage fill the room with their vibrant, powerful performance. Although Brooke and Trip are more on the liberal side, their father is the polar opposite. Lyman Wyth (played by Bob Chaves) is a former actor and ambassador, and current GOP (Grand Old Party) chair during George W. Bush’s presidency. However, despite his drastic political views that clash with his children’s, Lyman proves to be a very loving father to his two children, especially his emotional daughter, Brooke. The most serious one of the group is Polly Wyeth (played by Sue Schaffel). Only cracking a few smiles through all two acts, Polly goes right for the vodka once the newly reunited family begins to bicker. As Brooke and Trip individually begin to speak to their mother, her stern-hard-to-please attitude becomes visible. Polly uses a tough love aspect of parenting to her former-hospitalized daughter, in hopes of reminding her that she was once in a dark place and should never go back. It soon becomes clear that Brooke was hospitalized for serious depression, and was cared for by her mother for nearly a year. Through many of her monologues, the audience can clearly see the glimmer of hope Brooke has in her eyes, and how she strives for love and acceptance from her parents in everything she does. Right by her side is Trip, who conveys a loving, warm support system during Brooke’s times of need. The last family member to be introduced is Polly’s sister Silda Grauman (played by Melissa B. Robinson). A perfect addition to the already dysfunctional family, colorful, curly red haired Silda is a recovering alcoholic, temporarily staying with the Wyeths. Silda talks a mile a minute, but seems to have the most supportive insight out of both Polly or Lyman. Although she’s coined as being the one the most vulnerable for relapse, Silda shows to be calm and collected in any breakout that happens with her family members. Director Ryan Gunning does an excellent job in making a simple set of just a living room be the center of so many scenes. 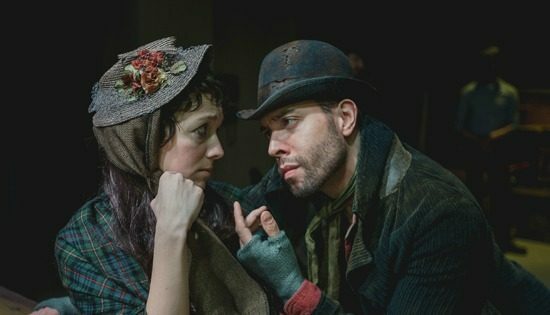 Gunning made it a point to have the play revolve around a common place, and turned a typical family reunion into a scene of controversy and debate. Exits and entrances happen smoothly, and the characters swiftly cover the entirety of the stage. The stage manager, student tech crew, light board operator and designers – all students – compliment Gunning’s direction with their warm set colors and precise lighting. Bright lights contrast the blue walls for most of the show, and by the last act the team brings it down to one spotlight to shine on Brooke as she concludes the play. Much of the play revolves around Brooke’s newly published book, encompassing the very sensitive topic of her late brother. The plot thickens as secrets are revealed, and the intensity of the actors becomes tense. The memoir soon becomes not just the story of how Brooke perceived her childhood, but also opens many wounds. 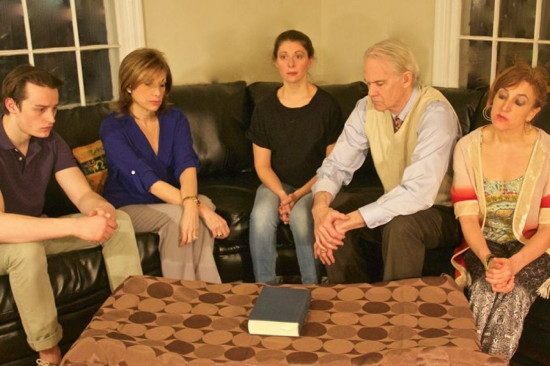 The actors in Other Desert Cities takes a story of a flawed family and portrays them in such a way that every audience member could find a Brooke, Silda, Trip, or Lyman in their own life. Advisory: Language. Recommended for ages 13 and up. Running Time: Approximately 2 hours and 15 minutes. Other Desert Cities runs through February 15, 2015 atHighwood Theatre, 914 Silver Spring Avenue, Suite 102, Silver Spring, MD 20910. For tickets click here. Emily Menase is a recent graduate from The University of Maryland, College Park with a B.S. in Kinesiology. She stage managed and participated in eight theatre productions in high school, and has been writing for student newspapers for five years. She currently works at a research organization in Gaithersburg, MD.